As the birthplace of Artemis and Apollo, the Greek island of Delos (Greek: Δηλος; Dhílos, "Brilliant") was a major sacred site for the ancient Greeks, second in importance only to Delphi. At its height, the sacred island was covered in a variety of temples and sanctuaries dedicated to a variety of gods. Today, it is a fascinating archaeological site located just two miles from Mykonos. Remains of a settlement found on top of Mt. Kinthos show that Delos was inhabited since the 3rd millenium BC. Originally known as Ortygia (Quail Island), it was a religious center and busy port from ancient times. Although a barren island with virtually no natural resources, its harbors are protected by the three islands that circle around it (the Cyclades) and it is conveniently located between the Greek mainland and the Asian coast. The Ionians colonized Delos around 1000 BC and made it their religious capital. The island was so sacred that, at one point, no one was allowed to be born or to die there - those about to do either were rushed off to the nearby islet of Rinia. A great festival, the Delia, was hosted here in honor of Apollo, Artemis and Leto, as described in Homeric Hymn 3. By the 7th century, Delos was also the political capital of the Amphictionic League. The Athenians soon joined the league and assumed control, giving the Delians trouble on a regular basis until around 315 BC, when the Egyptians became the rulers of the Aegean Sea. Delos was never forgotten, however, which meant further destruction and looting by the successive rulers of the area - pirates, Knights of St. John, Venetians, Turks - as well as its neighbors Mykonos and Tinos. In the 17th century, Sir Kenelm Digby removed some marbles from Delos for the collection of Charles I. Formal excavation work began in 1872 by the French School of Archaeology, which still continues today. The island is still uninhabited except for the French archaeologists and site guardians. Boats from Mykonos arrive on the west coast of Delos Island, in the Commercial Harbor near the south end of the ruins. The island is small, only 1.2km wide and covering 5 sq km of barren, hilly landscape. 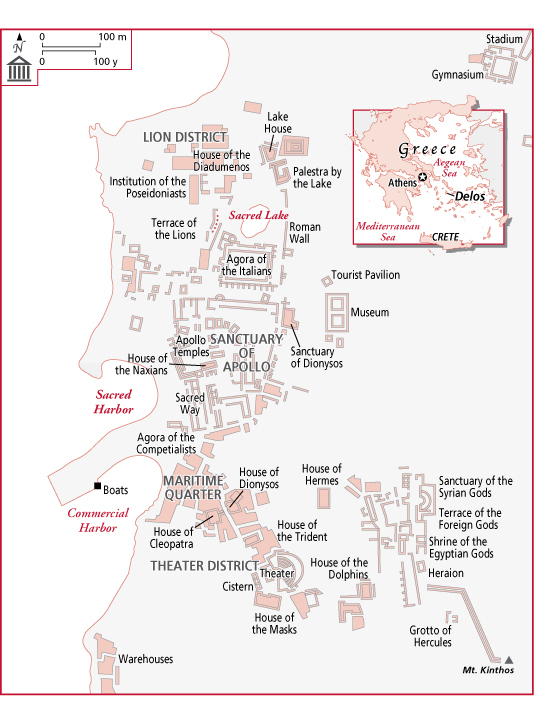 The ruins of ancient Delos extend north and south along the coast and consist of four main areas: the Maritime Quarter (next to the harbor); Theater District (southeast of the harbor); Sanctuary of Apollo (north of the harbor in the center of the site); and Lion District (north end of the ruins). A small tourist center in the Sanctuary of Apollo includes a pricey restaurant and bar, but no overnight accommodations. Informational signs among the ruins are in Greek and French. The first major monument visitors encounter is the Agora of the Competialists (c.150 BC), an open area occupying the area between the Sacred Harbor and the Commercial Harbor. In the center of the ruins is a round shrine and a square base, where offerings were placed. Further south in the Theater Quarter is the great classical theater of Delos (which could seat 5500 people) and more houses with mosaic floors. Especially notable is the House of the Dolphins (just east of the theater), with a fine mosaic depicting the gentle sea creatures. Robin Barber, Blue Guide Greece, 6th ed. (London: A&C Black: 1995), 649-61. Fodor's Greek Islands, 1st ed., 282-85. Below is a location map and aerial view of Delos. Using the buttons on the left (or the wheel on your mouse), you can zoom in for a closer look, or zoom out to get your bearings. To move around, click and drag the map with your mouse.